The big draw for the Mayakoba Golf Classic this year was Lorena Ochoa. Perhaps the best known golfer from Mexico. She was the #1 women's golfer in the world for three years in a row. 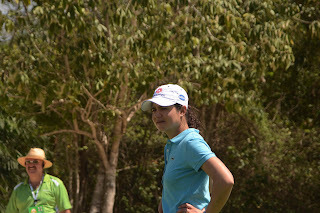 She was playing in the Pro-Am event. And what a treat to get to see her play. She was very gracious to the crowd. She signed autographs and posed for pictures. I snapped off a couple of pics and then it was time for us to leave. But it was a added bonus to have her at the event.